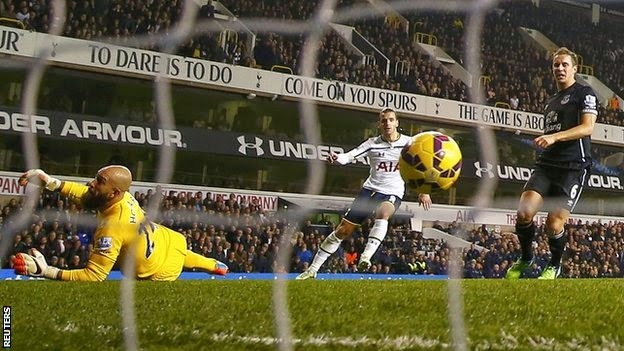 Tottenham's Roberto Soldado scored his first Premier League goal of the season with the winner as Spurs beat Everton 2-1 at White Hart Lane. The hosts had fallen behind early on to a brilliant Kevin Mirallas strike. But Christian Eriksen equalised six minutes later before the Spanish striker grabbed what turned out to be the deciding goal. Everton, who had a late penalty claim for handball ignored, drop into 10th place while Spurs go seventh. Defeat for Roberto Martinez's side ended an eight-game unbeaten run in all competitions, while counterpart Mauricio Pochettino finished a satisfying seven days that reaped three victories across domestic and European competition. This season the Londoners had lost four of their league matches that, like this, followed on from a Europa League fixture on a Thursday but they showed few signs of tiredness until late in proceedings. Spurs were energetic and combative from the outset but fell behind to superb piece of skill. Mirallas followed up his match-clinching goal against Wolfsburg in the Europa League on Thursday with a sublime effort, bent in off the underside of the crossbar from outside the area after the Belgian had evaded Soldado following a free-kick.